Thoroughly combine ground beef, salt, garlic, pepper, and soy sauce. Divide mixture into 8 equal patties (patties should be thin). Combine remaining ingredients; divide evenly atop 4 patties. Place another patty on top of each; seal edges (extra burgers for other meals may be refrigerated at this point until ready to cook). Cook on a grill, or under your stove’s broiler, until done. 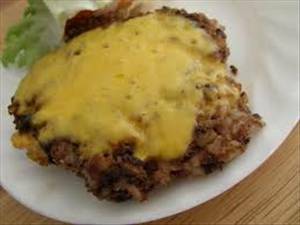 Finally, top with cheese; when cheese has melted, the burger is ready to serve. As a serving suggestion, “make it a combo meal” by serving with cauliflower, mashed potatoes, a low-glycemic steamed veggie, such as asparagus, and a diet non-caffeinated beverage (could be H2O). Note: feel free to experiment with different burger seasonings, stuffings, and types of cheese, be as creative as you like! Note 2: the interesting thing about stuffed burgers is that some ingredients are "stuffed" into the middle of the burger, so as these ingredients cook, they season the meat and contribute to its juiciness. 842 members have added this recipe to their cookbook. one of my favorite recipes, even good without the cheese! I've made a turkey burger version too. Loved it! I substituted the soy sauce with Worcestershire sauce and used pepperjack cheese, topped it with homemade barbecue sauce and it was DELICIOUS! This is highly recommended because it's so easy to make it the way you like it. Very good burger! We used onion,red, yellow, orange, and green peppers to stuff burgers. I would recommend cooking vegetables first in a wok to make them a little less "crispy." My family loved this and will definitely cook this again! I don't like mushrooms or soy sauce so I substituted them with zucchini and vinegar, and it was delicious! Better than non-diet burgers by far. This is truly delish!!! My husband doesn't really eat red meat and he attacked the plate when he saw the burgers!!! I will be making them often. We used turkey buger and it was incredibly DELICIOUS! The leftovers were so tasty chopped into a salad for lunch too! Thanks for the idea patdnaseq! Good idea to stuff the burgers with more veggies. There are 175 calories in 1 serving of Cheese and Vegetable Stuffed Burgers. Calorie break-down: 32% fat, 5% carbs, 62% protein.